E.S. (Ted) Rogers saw his dream come true in 1927. Radio was his life, and he was already a pioneer in the industry. As an eleven-year-old prodigy, he was on the air with his own transmitter licensed as 3BP. 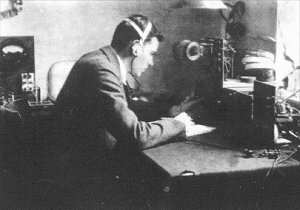 At 21, he was the first Canadian Radio Amateur (Ham Operator) to send a radio signal across the ocean to Europe. 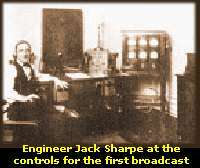 His half-kilowatt spark transmitter was one of the first licensed amateur sets in Canada. 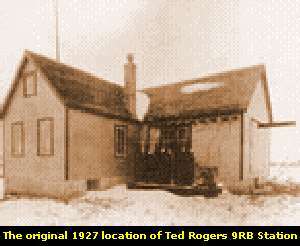 By 1927, Rogers was ready to put his batteryless radio station into use from the family farm home North of Toronto near Aurora, Ontario. Ted modified his 3BP Ham Station moving it from the 1800 kHz Amateur band onto 1030 kHz with the experimental commercial call-sign of 9RB. Then in January of 1927 a voice as strong and clear as though it were in the room with you - pure, strong strains of music! Then you heard the words, "This is 9-R-B Testing." This was an exciting discovery for you and for all those in eastern Canada and the United States who heard it. This was a voice that spoke for a new era in radio. 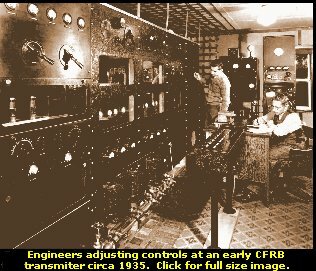 Finally, on February 19th., Jack Arthur raised his baton and a symphony orchestra poured music into the air with astounding power and clarity as the original experimental 9RB station converted to commercial operation and was on the air as CFRB and Canadian radio had made history. In 1933 CFRB, now transmitting at 630 kHz, installed two steel antenna towers at Aurora, replacing the wooden masts, and boosted its power to 10,000 watts. This photo depicts the engineers adjusting this new transmitter. Note the water pipes at the bottom of the centre racks that was used to water cool the final amplifier tubes.